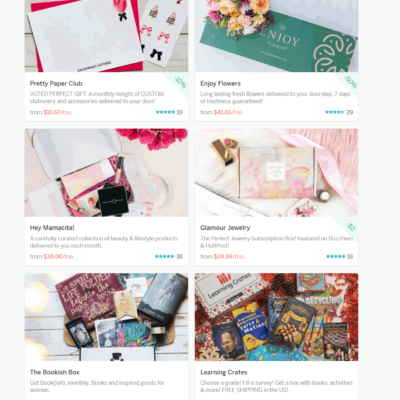 Pretty Paper Club is a monthly subscription box that includes personalized stationery along with hand-picked stationery accessories. 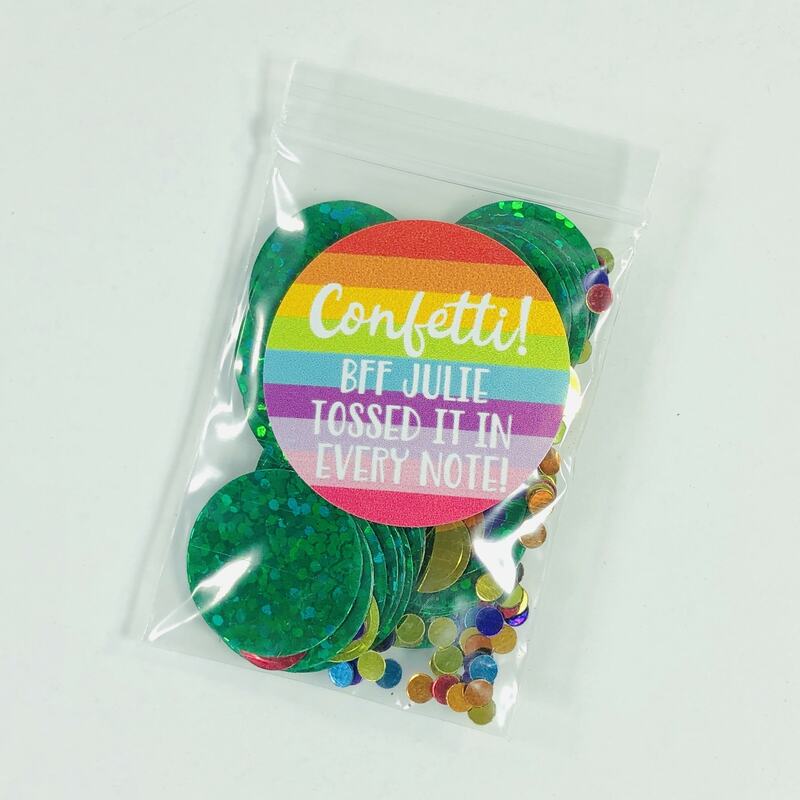 They search the planet for adorable items that make you smile…clips, gel pens, pencils, washi tape, stickers, confetti, and more! 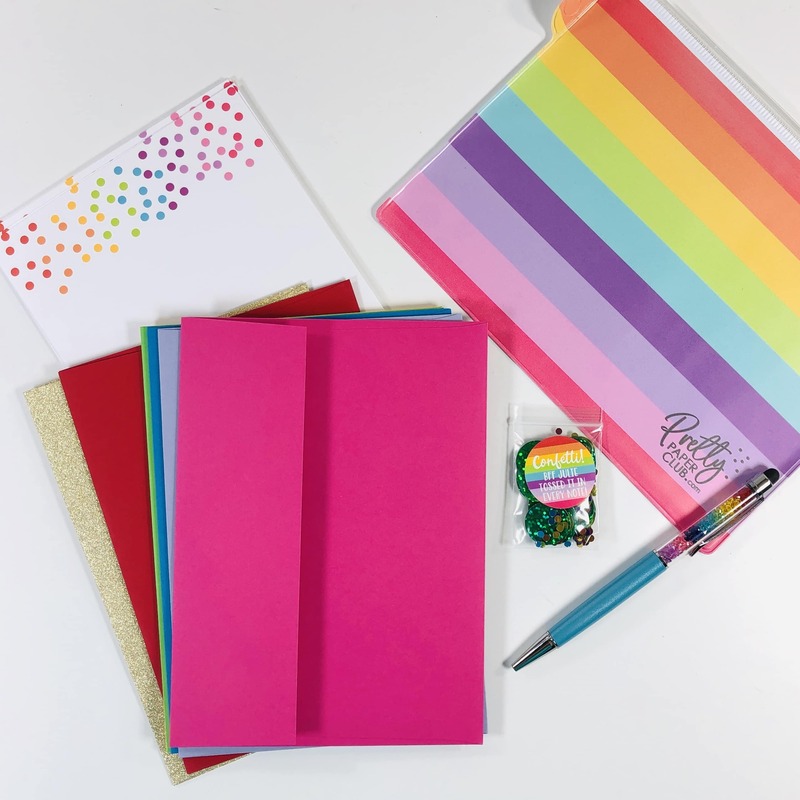 They have two plans to choose from: Custom Stationery is $20 a month and includes “custom notecards, envelopes, labels and a FUN SURPRISE”; Deluxe Custom Stationery is $40 a month and includes “personalized stationery along with a generous assortment of hand picked stationery accessories”. We ensure that every set you receive will not only be personalized, but will coordinate with the rest of the items in your box! 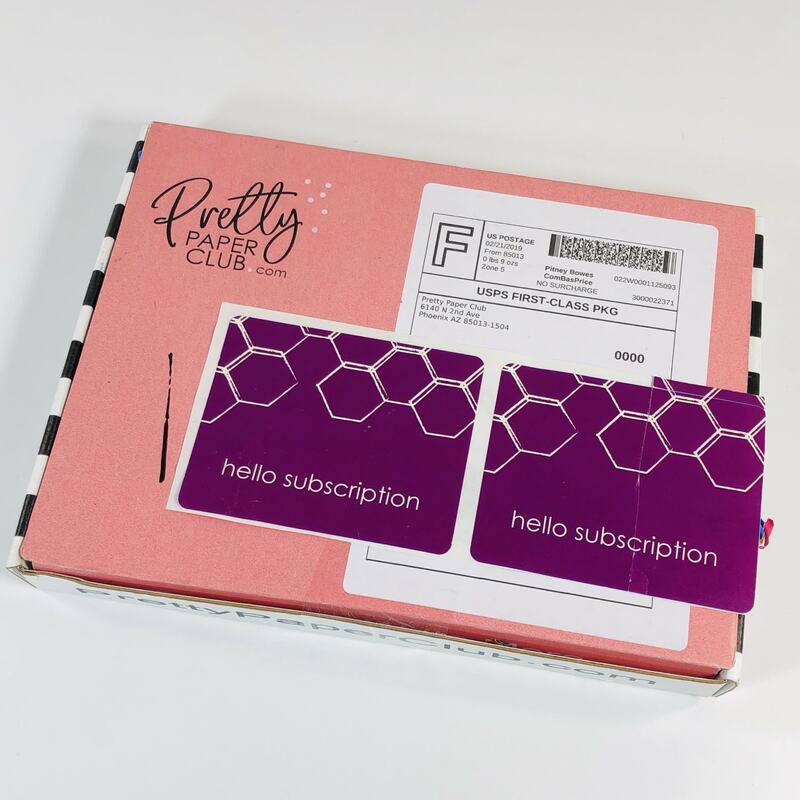 Run to your mailbox with excitement each month when your package of paper fun arrives! DEAL: Get 10% off the first membership order. Use coupon code HELLOMAIL. Valid to prepaid options as well. My items were tucked into rainbow colored paper squiggles! 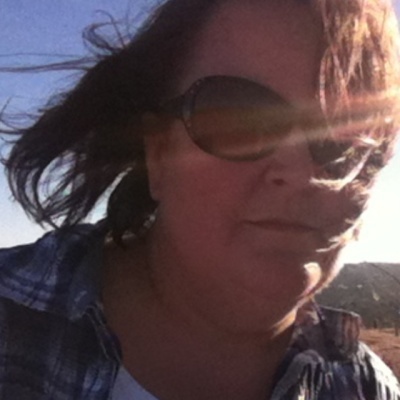 I am reviewing the Custom Stationery Box, which is $20 a month. Looks so pretty! I love rainbows and think this is the perfect theme for the upcoming month. Keep in mind that Pretty Paper Club sends their items for the next month ahead of time, so this February box is full of March-related items! There was a card with a hint on how to use the items from this box. 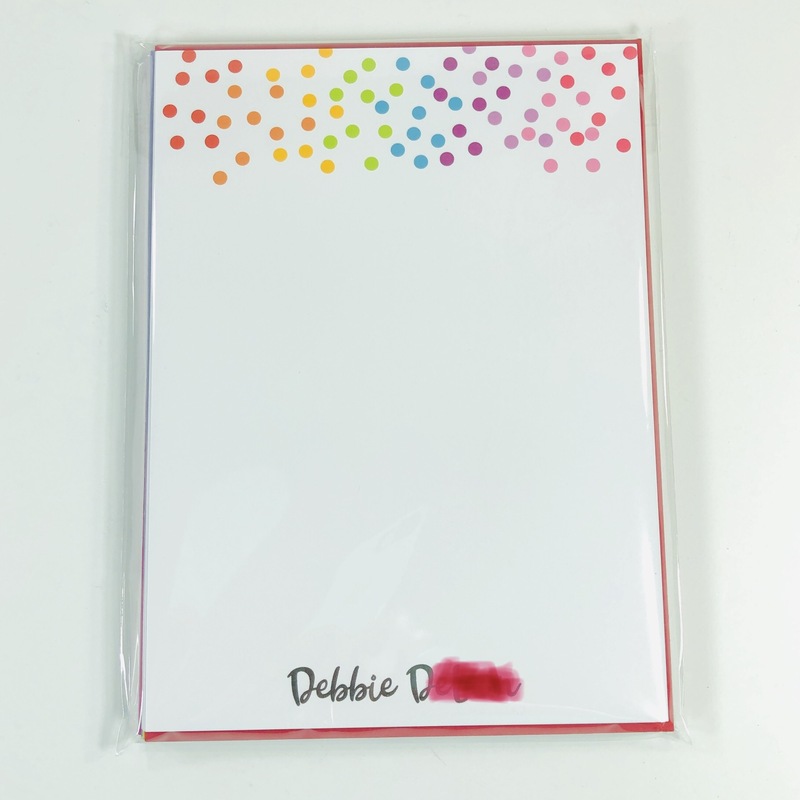 The back of the card has a March calendar that you can place in a holder or paste into a bullet journal. 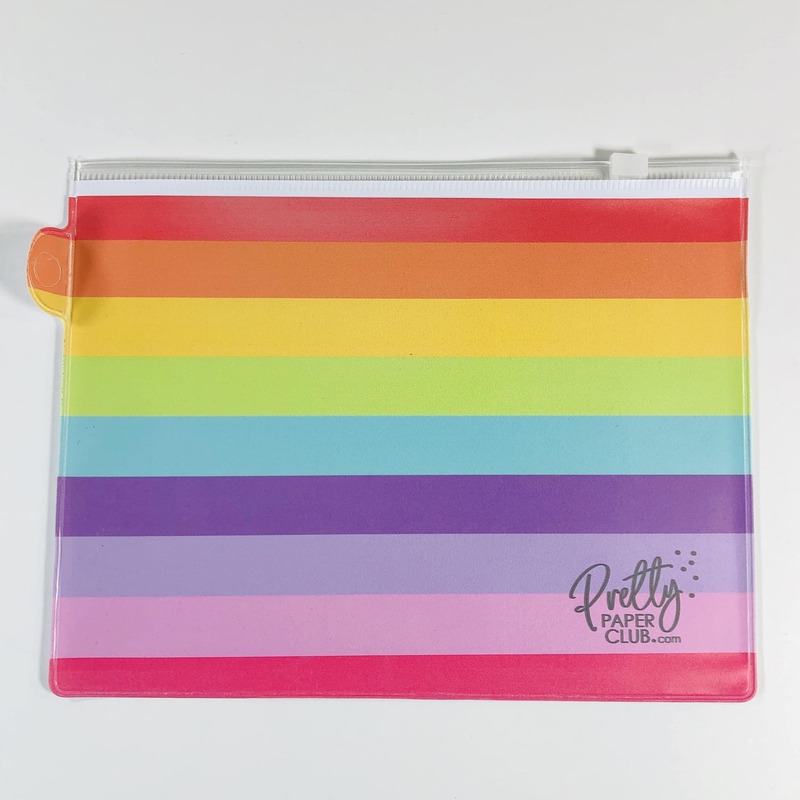 Pretty Paper Club Pouch Rainbows are so pretty, and I adore the vibrant colors on this pouch! They feature the classic Roy G Biv pattern, with a couple extra thrown in for good measure – maybe they are infrared and ultraviolet? 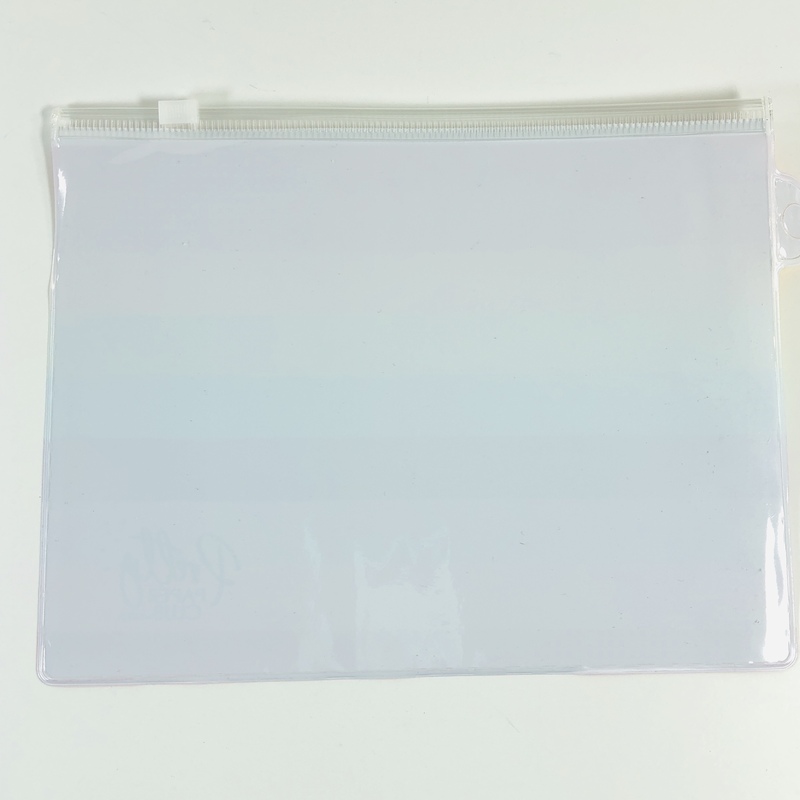 The flip side is clear and the back or the rainbow is opaque white. The top has a slide closure and it looks like there is a place to attach it to a ringed binder. Smells like it is made of vinyl. Rainbow Crystal Stylus Pen OK, I was really excited to see this pen, I love crystals and this one is just adorable! The crystals are fixed in place so they don’t make a sound as I write. You twist the silver part near the writing end of the pen to make the tip appear. The part that looks like an eraser is actually a stylus that you can use with a tablet. Confetti shows up in every box as a tribute to the owner’s friend, who sadly passed away much too young. I think this is a great way to spread joy. Personalized Notecards I found a pack of 8 cardstock note cards and 7 colorful envelopes. The cards are about 5″ x 7″. I don’t know which envelope to use first and it made me smile to see all of the lovely colors, and even the pot of gold (envelope) at the end of the rainbow! 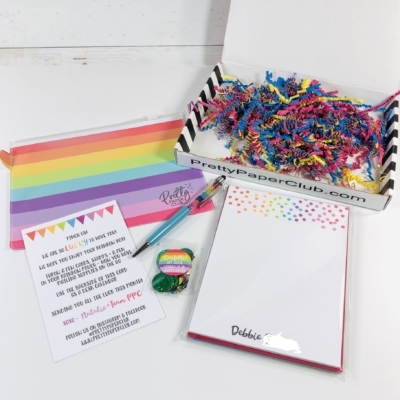 Pretty Paper Club sends such cute and interesting items that infuse some happiness into my letter writing sessions each month. 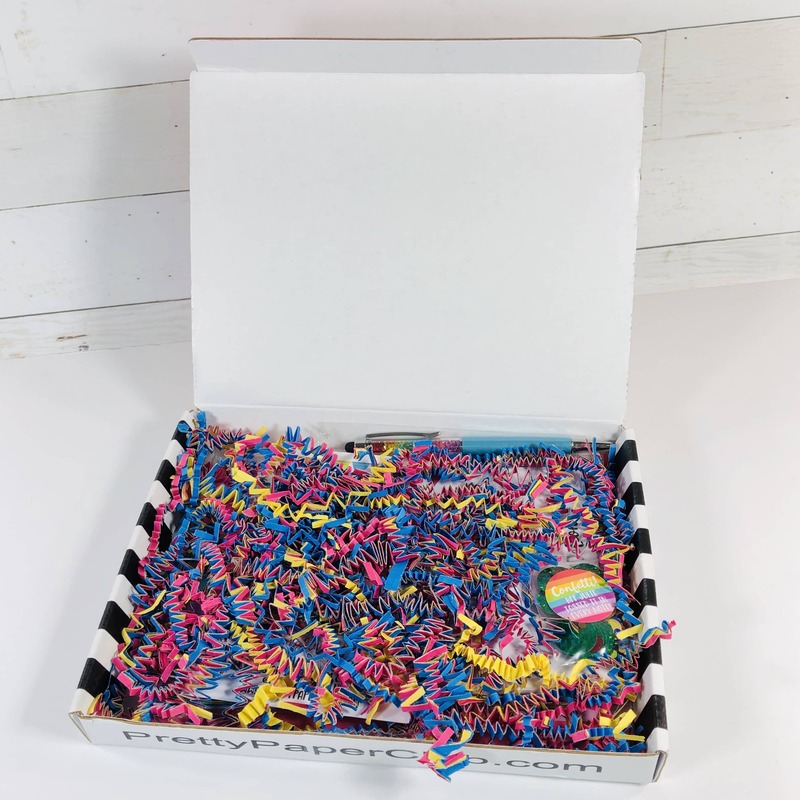 The whole box looked cheerful and I loved seeing all of the bright colors in what can sometimes be a dreary, dark month. 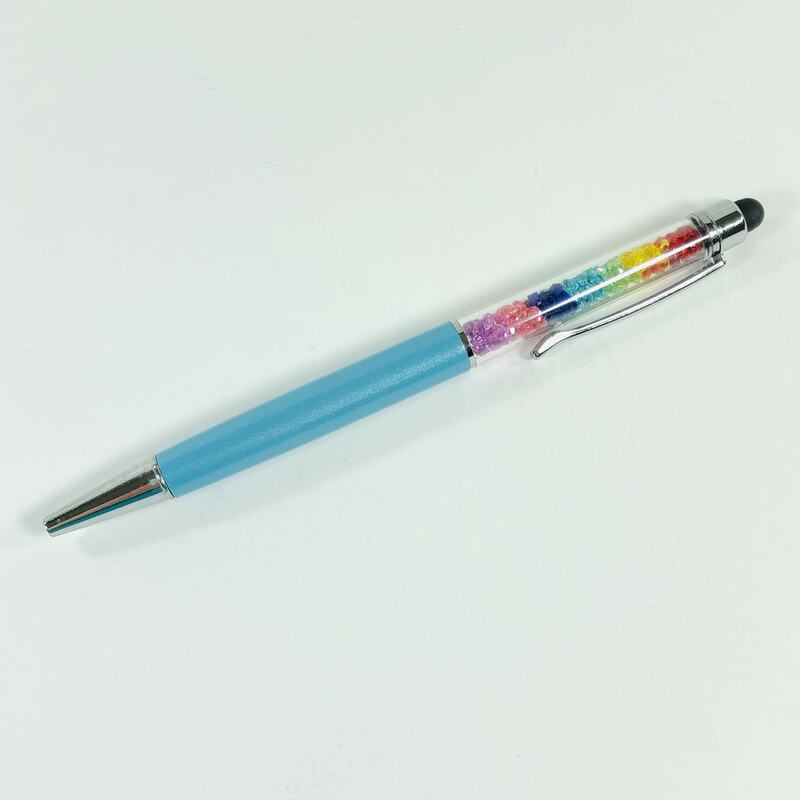 The rainbow pen pouch was unexpected and the crystal pen will make me smile each time I pull it out of my purse! What do you think of this month’s Pretty Paper Club? 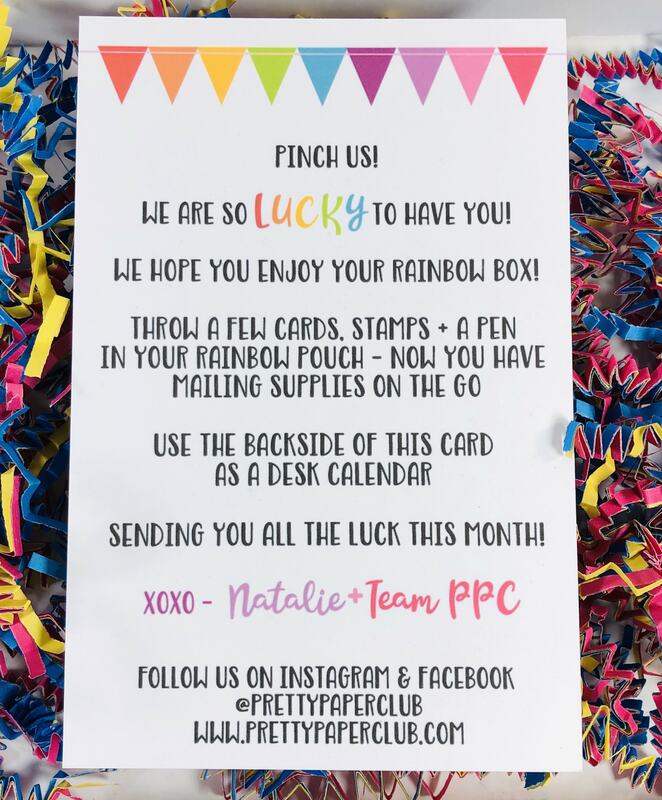 Visit Pretty Paper Club to subscribe or find out more! Run to your mailbox with excitement each month when your package of paper fun arrives! 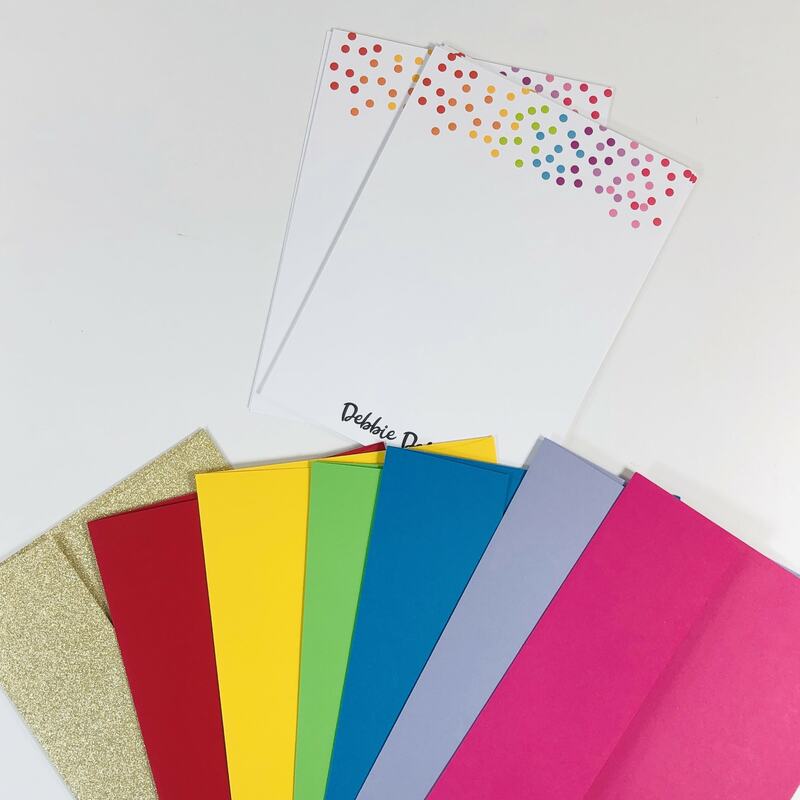 Your set will include personalized stationery along with hand picked stationery accessories. 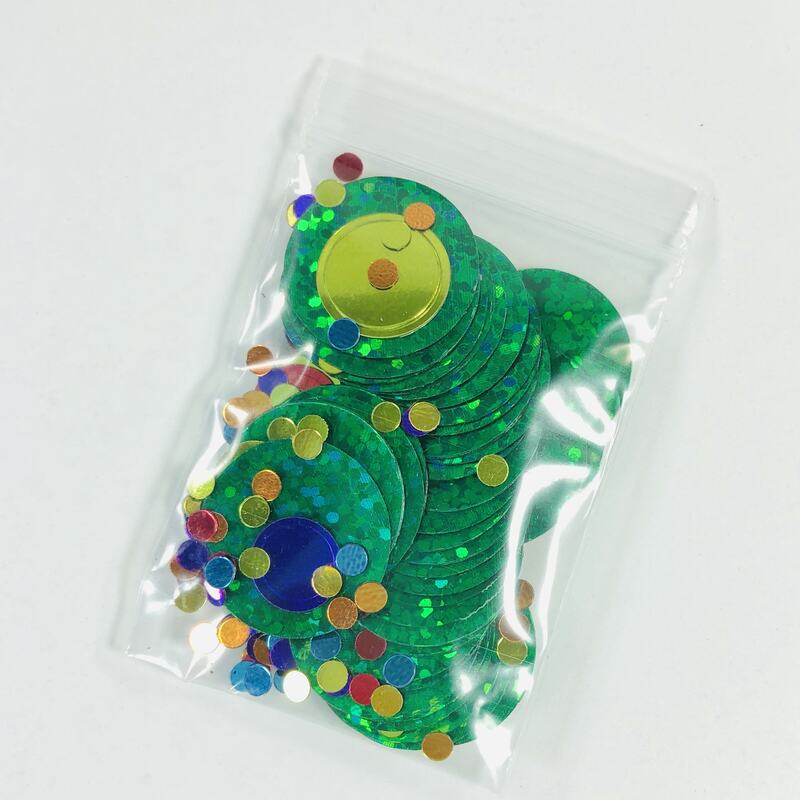 We search the planet for adorable items that make you smile...clips, gel pens, pencils, washi tape, stickers, confetti, and more! Get 10% off the first membership order. Use coupon code HELLOMAIL . Valid to prepaid options as well.